Do you want to work nights and weekends, and leave your weekdays free? Start an office cleaning business. Work is usually done after routine business hours. That means you can do as you like with your mornings and afternoons. Night owls do well in this business. So do moms and dads with school-age kids. Make time for your personal life and do anything you want during the daytime. Do you want to keep your daytime hours free and earn a good income? The office cleaning business could be just right for you. This article explains why starting an office cleaning service might be a good fit for you. I’ll also give you pointers on how to avoid 5 common mistakes when starting to market your business. 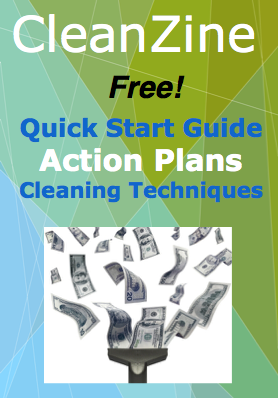 You might be surprised to learn that the office cleaning business is easy to start and pays well. Your business can easily fill a local niche because fewer cleaning services want to work hours “outside the box.” Starting an office cleaning service might be a good fit for you. Reduce or eliminate your competitors by working the hours others don’t want to. Office workers have gone for the day. Cubicles, hallways, and restrooms are free of foot traffic. You and your team—or just you, if you like to work solo—will find the quiet environment ideal for working quickly and steadily. Far better than attempting to clean in a busy office building with people at their desks. Distractions will cost your cleaning service valuable time. You can’t do your best work with others in the way. Office cleaning services working weekends or evenings can translate to a bigger paycheck for fewer working hours. Tasks are accomplished faster and with better focus, so it’s easier to make the client happy. This builds strong contractual relationships between the cleaning service and the customer. Your cleaning service starts to build a solid reputation, and your business grows. Most people like the idea of better pay and increased job security. However, not everyone is cut out to start an office cleaning service. Cleaning crews don’t need a college degree, but jobs will go smoother if everyone on the team is alert and security-minded. Office cleaners must pass background checks and meet security criteria. Compared to other types of cleaning services, office cleaners may face more security risks. Staff may have access to sensitive materials. Everyone is expected to abide by the rules and use common sense when completing tasks. Cleaning helps you keep in shape! Crews should also be physically fit enough to handle the tasks that come with the job. In any cleaning business job there will be bending, lifting, and carrying to do. Many office buildings have stairs to negotiate as well. An office cleaning service has a lot going for it. Almost anyone wishing to start their own business could make good money and keep in shape. Want your cleaning service to succeed from the start? The formula for success is similar to any other professional endeavor. It takes a willingness to work hard, stick with it, and deliver outstanding service. Many self-employed people have discovered that cleaning is a profitable service. Office cleaning in particular may appeal to people looking for a regular income while working outside regular business hours.